April showers bring big bonuses to play the hottest online slots at Slots Capital Casino! Redeem the coupon code ADOREAPRIL before your next deposit of $35 or more to claim your 300% match bonus. New players will also receive an instant $10 free chip, no deposit required sign up bonus after creating an account via NoLuckNeeded.com. Good luck! Register a new account today at Slots Capital from noluckneeded.com by clicking here and receive an instant $10 free chip. Claim the bonus in the casino cashier. 60x wagering requirement; $,€ 180 maximum cash out. Check the excluded country list below. The maximum bet allowed when a bonus is active is $10 for all players. Claim the bonus in the casino cashier. $20 minimum deposit. 30X Playthrough requirements; No maximum Withdrawal; non sticky bonus. The maximum bet allowed when a bonus is active is $10 for all players. Iran, Iraq, Israel, Kazakhstan, Kyrgyzstan, Lebanon, Mexico, Moldova, Netherlands Antilles, Pakistan, Philippines, Puerto Rico, Singapore, Syria, Tajikistan, Turkmenistan, Uzbekistan, Virgin Islands (U.S.), Kentucky (U.S.). Players from the following countries do not qualify for the free no deposit bonus. Slovakia, Slovenia, Sweden, Tajikistan , Turkmenistan, United Kingdom, Ukraine, Uzbekistan. Slots Capital is a Rival software online casino and a proud member of the award-winning Deckmedia (SlotoCash) casino group. 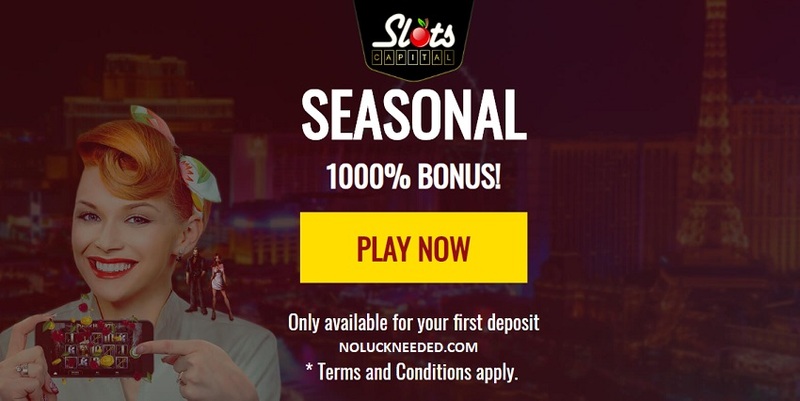 Established in 2012, SlotsCapital is rated 4 out of 5 stars by NoLuckNeeded.com due to reliable player payouts and good customer service.Click here to read and share Slots Capital Casino reviews, ratings, or complaints in the NoLuckNeeded Casino Directory.